Mönchengladbach - FC Bayern München carried on where they had left off in 2013, extending their unbeaten run to 42 games with a 2-0 victory away to Borussia Mönchengladbach. A superb display from Swiss winger Xherdan Shaqiri ensured the visitors did not feel the absence of both Franck Ribery and Arjen Robben as keenly, and after making his first starting XI appearance since Matchday 8, the 22-year-old gave his thoughts to bundesliga.com. bundesliga.com: Xherdan Shaqiri, congratulations on the 2-0 win. How happy were you with your performance in the team's first competitive game of the year? Xherdan Shaqiri: We're happy. It wasn't an easy game and we knew that Gladbach wanted to get one over us, but we played well, created chances and, at the end of the day, we deserved to win. I think this was the perfect start to the second half of the season. bundesliga.com: FC Bayern scored the goals while Gladbach hit the post twice. Was Bayern's efficiency what made the difference today? Shaqiri: We were the better team for the whole game. Sure, Gladbach threatened now and again with some good counterattacks, but we knew that they have good players on the break. It got a bit hairy once or twice, but overall, we dealt with them very well and deserved to leave the field as winners. bundesliga.com: How good were FC Bayern in their first game after a five-week break? Were you back to the same level as in the first half of the season? Shaqiri: I don't think that we've dropped our level compared to the first half of the season. We wanted to carry on from where we left off and we're on the right track. We want to clinch the title as soon as we can – that would be fantastic, but there are many games to come. Shaqiri: We've proven often enough that no matter who's on the field, we've got a fantastic squad with good players and you could see again today what a great troop we have and that other players can do just as good a job. bundesliga.com: The fans were singing 'We're the world's number one'. How does that sound? Shaqiri: Many see us as the best team in the world, and I also think we're playing very good, attractive football. But we always want to improve and get as far as we can in Europe while continuing to put our own stamp on games. Shaqiri: It's nice to see the table like that, but we've got plenty of important games ahead of us. This was the first important match and we're heading in the right direction to win more trophies. bundesliga.com: You now have a midweek Bundesliga match at Stuttgart, and then you host Frankfurt. Is it good to have such a busy start to the year to get you back into the swing of things, or is it a bit too much all of a sudden? Shaqiri: We had enough of a break and prepared well for these games. It's perfect for us to have these games now. We want to get back into our rhythm again and we're in great shape. bundesliga.com: Can you see any other team who could be a threat to you, or can Bayern only really beat themselves now? 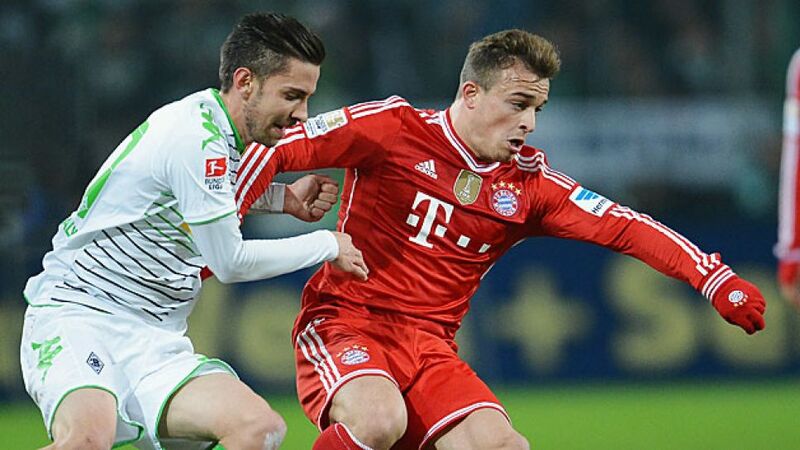 Shaqiri: We're the number one in the Bundesliga at the moment. We've got a ten-point cushion and we're going to take some stopping, but anything can happen in football and that's why we have to carry on playing well and win the important games we've got coming up too.